I’m not generally a sappy person, so please my excuse my lack of gushiness about my first Mother’s Day. Don’t misconstrue lack of gushiness with lack of appreciation because I am very grateful. I knew what I wanted to do for my first Mother’s Day for a long time. 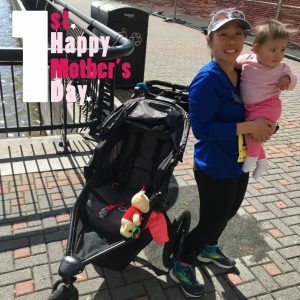 That’s because there is a stroller race hosted by the local running group, Hoboken Harriers, as a part of their larger 5-mile race every Mother’s Day. I ran the 5-mile race many, many years ago and when they first introduced the stroller race, I knew I wanted to run it one day. So naturally I was super excited that Charlotte is old enough to go stroller running with me this Mother’s Day. Instead of taking our time on Sunday morning, we quickly ate a light breakfast and got ready for the race. Charlotte and I ran down to the start (a little over 1.5 miles away) with the stroller and Josh met us down there on bike. He picked up our bibs and was waiting for us at the start. We got there just in time to pin on the bibs. It was a casual race, only 3 strollers at the start (and it looked like there may have been 2 more that started late). 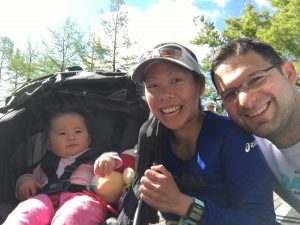 I was fumbling with my watch as I wanted to “Garmin-record” my first stroller run but didn’t manage to do so before the first runner took off and my inner competitor had no choice but to sprint after her! The race was a 1.5 mile out and back. Unfortunately the streets were not closed for this and there were a couple of points we had to be very careful to make sure we were not running too close to moving cars. Our stroller runs are generally very easy ones and we go at whatever pace I can do that day with stops at the playground and dog run (which reminds me that I have been meaning to write a post on getting started with stroller running). Needless to say, my newbie-stroller-running-self was not prepared for sprinting the race. My body was not terribly happy with me especially after having completed the Citi Field Sprint Spartan the day before (recap on this to come). We finished the race in 2nd (out of 3 or 5)! It wasn’t officially timed and since I was fumbling with my watch, I don’t have an exact record of time. My guess based on the splits from our whole run (to/from race and race) on Sunday is that we were running around 8:30-8:45 min/mile for a total time of roughly 13 minutes or so. Regardless of time, it was so fun to take part in our first stroller race and it seemed like Charlotte enjoyed herself as well. What a great way to celebrate my first Mother’s Day! The rest of the day we spent relaxing and eating a lot of food! Eating, in my opinion, is the next best way to celebrate any day after a run! Hope everyone had a great Mother’s Day! 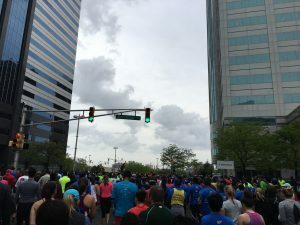 This past Saturday, I ran the Newport 10K in Jersey City. Even though this race is in our backyard, it’s the first time I have run it. Right now, I’m not actively training for anything specific except to maintain base mileage before the start of fall marathon training so I am enjoying these weeks to run whatever mileage I feel like. The Newport 10K starts in Newport Town Square which is about 2.5 miles from our apartment. I used this as a warm-up run as I find that lately I struggle in the first couple of miles before finding my groove. As a side note, I never thought I would one of those people who runs extra miles before a race. I used to look at those runners and think woah, they ‘re committed (and nuts!). Ha, now I’m one of those people – not sure about committed though but definitely nuts. There was no pre-race bib pickup so I knew I needed to leave enough time in the morning. The race website and emails did advise against bringing a bag to the start area but since I knew I would want to take an Uber back and it was cooler when I left the house, I ran with my running backpack (by the way, I have the Deuter Speedlite 15 and I love it!) to make sure I had a clean shirt and bottle of water with Nuun for after the race. All of the information about the race said that bags would need to be left in an off site location but it didn’t mention that you could not get into the area where bib and t-shirt pickup is with a bag. That whole area was completely fenced off with police and I was directed to bag check first to drop off my bag before I was allowed in the area to pick up my bib. This is counterintuitive as I didn’t have a number to pin to my bag and the volunteers at the bag check tent needed to write my name on a sticker that was then pinned to my bag. Since I didn’t have my bag anymore, I didn’t pick up my t-shirt in advance of the start. I quickly grabbed my bib and then made my way to the start with a couple of minutes to spare. There were signs to line up based on pace. I wasn’t sure what to expect with pacing so I just lined up with the 9:00 min/mile area which was likely conservative but I also didn’t want to push my way up further. The first mile or so was extremely crowded and I spent a bit of time dodging and weaving through the crowds. I’m familiar with Jersey City but it was still nice to run through the different neighborhoods, some of which I haven’t explored before. The weather was really humid and parts of the course were extremely windy. There were also potholes along most of the route. You’re not really supposed to run looking down but I did for a good part of it to avoid the potholes and puddles. I was extremely worried about turning my ankle or tripping which I’m known to do! The last mile of the race was along the gorgeous Hudson River waterfront. I don’t know my official splits and my watch was slightly off due to the weaving and it looks like some of the buildings affected GPS signal in the last mile (my watch recorded a 6:30 last mile which is definitely wrong), however, I think I ran a fairly consistent race of roughly 8:30-8:50 minute miles. It definitely helped that I warmed up in advance. My official chip time is 55:02; 8:51 min/mile. Towards the end I thought I may have been close to a PR (which would have been awesome given the lack of speed work in the last 1.5 years), but it turns out I’m about two minutes off – hey, not terrible though! After the grabbing a cup of water at the finish, I wanted to pick up my bag first before getting my shirt since it was in the direction of home. However, the police made it clear that I couldn’t go back in to get my shirt if I had my bag so I opted to not get it. It was annoying that to exit the area after picking up my bag, I had to cut through the course. While it wasn’t a huge deal to do that I’m always afraid of getting in the way of runners especially so near the finish line. And my last rant about this race was that while the race was timed in both clock and chip times, ranking was done based on clock time. I’m used to races that pick either clock or chip time and by default ranking would be done off of that. If chip time is available and there is over 1,500 runners, I would think ranking on chip time would make sense. Don’t get me wrong, I’m not the runner who is gunning for prize money but I am gunning for self-motivation and accomplishment. It appears that based off of clock time, my placing is lower than that of chip time and hey, every place matters even when you’re the average runner! Overall, I’m glad I ran this race but will it do it again next year? Not sure… hopefully some of the logistical challenges of bag check and timing gets worked out.